The TNL's Polgahawela transmission station was shut down because it had not paid the licence fee to use VHF CH 11 or VHF CH 3 frequencies, the Telecommunications Regulatory Commission of Sri Lanka (TRCSL) said. The TRC said Telshan Networks (Pvt) Ltd. (TNL) had obtained valid licences for nine such stations by paying the relevant fees for 2018. “The TNL has transmission licences for Colombo, Nuwara Eliya (Mt. Oliphant), Karagahatenna, Piliyandala, Awissawella, Badulla, Gongala, Hantana and Ratnapura. It has operated VHF CH 11 and CH 3 from time to time for a considerable period of time in contravention of Section 22 of Sri Lanka Telecommunication Act No. 25 of 1991 causing interference to other licensed Government broadcasters. The TRCSL informed TNL to shut down this illegal transmission on April 27, 2016. It had ignored our letter and continued transmissions causing interference to Government channels and without making due payment, causing loss to the Government,” the TRC said. It said action was taken against illegal broadcasting stations operated by different companies including Sri Lanka Broadcasting Corporation at Balangoda. The Polonaruwa baiyas might believe you. Regardless,under the very Law you refer to, it is the minister in charge that should have acted. This is nothing but arbitrary action by Malli boy. Minster in charge for action - my foot. The law is clearly written down - no damn minister is required for the law to take action. The communique issued by the TRCSL on this issue is very vague and one tends to feel that it is purposely done. It is not clear from which year the TNL had not paid the fee for whatever the reasons they have. Is it from 2016 or 2018? Obviously there is some dispute as they have paid for all the other stations. This is utter garbage from a governmental agency that is suppose to regulate the broadcast of frequencies within Sri Lanka. 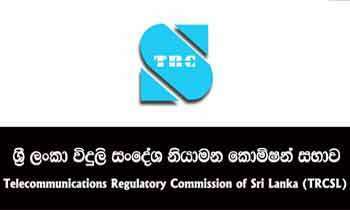 First TRC tells "in contravention of Section 22 of Sri Lanka Telecommunication Act No. 25 of 1991 causing interference to other licensed Government broadcasters" does that mean TRC has allowed the gov't to transmit on the same freq as the TNL Polgahawela transmission station ? or the TNL transmitter is so inefficient that the side lobe causing interference with the other stations ? TRC explanation on this is unsatisfactory to anyone who understands the broadcast industry.